Gone is the era when we had just 2-3 materials to choose from while buying Siding for our buildings. Now we have a plethora of options and finding the right fit takes a lot of research. One of the most commonly used materials these days is Vinyl Siding owing to its durability, relatively cost effective, and eases of installation. Most of the vinyl siding products come with a Do-it-Yourself guide or can be installed using moderate help from the experts. The best part about PVC (Polyvinyl Chloride) is that you don’t need to completely remove your old siding to install this; it can be installed on top of your existing siding. 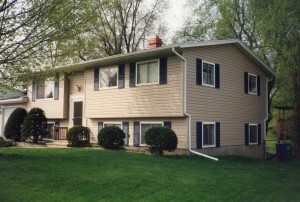 Not only does it give your house a new look, but also saves you the trouble of dismantling existing siding. Over the course of this article we will cover the various Vinyl siding trim options&Vinyl siding trim types to help figure out the best match. PVC has the advantage that it doesn’t need to be painted to avoid rusting. It generally can last extreme weather conditions and is not prone to insect damage like some other siding materials. A properly maintained Siding can last anywhere from 20 years to lifetime of the house! Earlier PVC came in only white color since it had the tendency to fade with constant UV rays but now the progressive versions of the product come in multiple shapes and colors. To install Vinyl sidings, we need a series of special products that are used to fasten the siding panes to the building walls and seize the cut portions of the sidings. These consist of J-Channels, Corner Posts, Starter strips along with related Vinyl siding trim pieces. Most popularly used J-Channels come with opening of 0.375” to 0.5” to attach with siding panes. For using horizontal sidings, J-Channels with 0.5” to 1” openings for the best fit. It is absolutely essential to figure out the best correct channel to obtain a comfortable, weather proof fit. These Vinyl siding trim pieces are not only used to obtain the best fit but also for better visual appearance of the fittings. Some of the pieces used for above purpose include F-Channels, Trims & Drip caps. Available in multiple shapes and sizes to accommodate all types of PVC for the Outside corners of house walls. These components are available in all shapes and designs ranging from matt to embossed finish. These are made to appear as wood pieces from a distance with the kind of finishing provided. Keep an eye for incorrectly formulated shrill PVC products as they are more likely to rust and buckle under unfavorable weather conditions. Generally using nails in PVC siding can lead to collapsing and unstable sidings. To prevent this, always maintain a standard nailing spacing of about 16 inches for horizontal sidings whereas 12 inches for vertical ones. Many companies have their own Vinyl siding trim products and major brands include Kaycan, Alcoa Buildings, Wolverine& CertainTeed. These companies offer a highly versatile range of products that make this mechanical sidings look much more appealing and weatherproof. Installation of PVC is quite simple and can be easily done using the guides, provided that you have the right set of attachments available. These Vinyl siding trim products include J & F style channels, corner posts, strips along with related Vinyl siding trim pieces. Again, the key is to judge the best fit products to gain the maximum benefit since these can turn out to be lifetime investment.